Another traditional French dish…cocotte has different meanings in French but is used in our modern slang, calling someone “ma cocotte” is somehow like “honey” or an endearing word. It probably goes back to last century meaning where cocottes were prostitutes selling their services to high profile clients. We have since then kept a popular expression “ca sent la cocotte” meaning “it smells like perfume” (the strong kind). Kids call a hen a cocotte as well . Then you have the cocotte minute which is a pressure cooker, or just a cocotte which is a cast iron utensil used to braise certain dishes and for slow cooking. As you can see cocotte has a lot of different meanings…and you probably don’t care about those linguistics precisions but I thought food is so linked to a culture that for me it’s important to understand where it comes from. 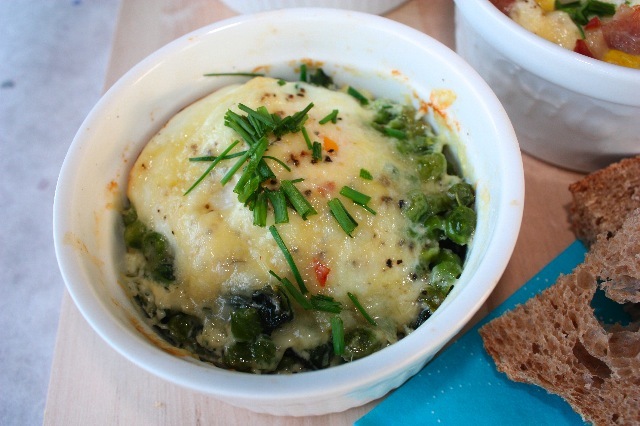 These eggs cocotte are so versatile, you can add anything to your egg, any greens such as spinach, mustard greens, etc… are perfect. I added some bacon in some of them but it’s optional, if you prefer to keep it vegetarian, it’s delicious too. The great thing about those is that if you really don’t have time to cook and have some eggs in the refrigerator, and a few veggies, you can make them a very short time. Preparing time is short and cooking time as well. You will need a souffle dish or deep individual dishes. Bring water to a boil, add salt. Add the greens previously washed. Cook for about 5 minutes, drain excess water cut roughly and set aside. Defrost peas. Butter the souffle dishes, add some greens, add peas, add salt and pepper and drizzle with some olive oil. Add cream. Break an egg on top, top with gruyere, salt and pepper and cook for about 3 minutes in the oven at 370F, to get soft eggs, or a little more to make them harder. You can also add some bacon. Sprinkle with chives and serve hot with country bread. This entry was posted by silvia on May 6, 2009 at 8:17 pm, and is filed under Appetizers, Express - Less than 30 minutes, Vegetarian - dairy. Follow any responses to this post through RSS 2.0.You can leave a response or trackback from your own site. That’s one of my favorite way to cook eggs. 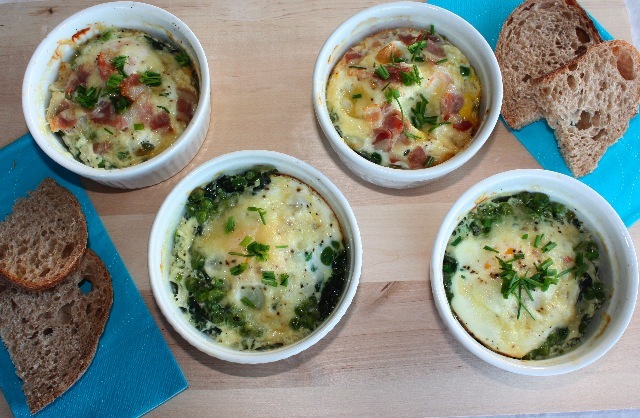 I usually prepared the eggs cocotte with leek fondue or sauted mushrooms. Very tasty! These look great, I can’t wait to cook these for brunch this weekend. This would make a great brunch, or even dinner, meal. What’s great is that it’s so versatile. You could use a large variety of fruit, meats, and cheeses. Yum! Beautiful pictures! What a great egg dish! Thanks everyone for your great messages and thanks for reading my recipes. Yes, you can make those with any ingredient you like. This is just one way to make them that I like. You can use smoke salmon, spinach, cream and chives. You can use ham, gruyere and cream…, etc. You just need a ramequin and that’s it! ohhh…my…this is exactly what i want for my sunday breakfast. looks just delicious! your dish has finally convinced me to buy ramekins; thanks! 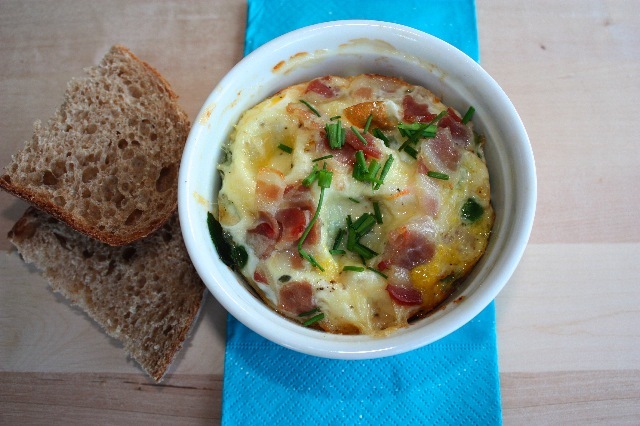 You can use ramekins for soufflés as well, and cook all kind of things in there. I love them!